This stem will only fit the system pipe with the tapered fitting stem, which should have one of the numbers listed above stamped underneath the pipe. If the number has worn off please refer to our pipe listings for measurements. Please note this refers to pipes manufactured after 2010 and will not fit 9mm filter models. If in doubt please measure the diameter of the shank. Fishtail mouthpiece: Peterson’s trademark, patented, mouthpiece is the P lip design, which has many advantages but unfortunately some smokers just don’t get on with it. 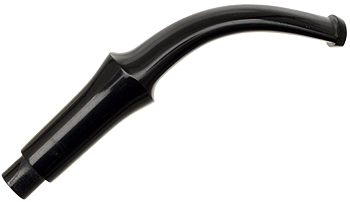 Peterson are in touch with their pipe smokers and understand that even though it is the best designed mouthpiece some smokers don’t agree and can’t get on with them. They therefore produce fishtail mouthpieces so you can swap it if you don’t like the P.Lip but want all the other benefits of the Peterson System.